Republican presidential candidate Jeb Bush's tax reform plan would cut taxes for pretty much everyone. It would also simplify the tax code in many ways. And it contains plenty of elements to spur economic growth. But it also offers some of the biggest benefits by far to the wealthiest taxpayers and would raise the country's debt by nearly $7 trillion over a decade. That's according to a new analysis of Bush's plan published Tuesday by the nonpartisan Tax Policy Center. Individuals: Reduce income tax rates from seven to three: 10%, 25% and 28%. That's well below today's top rates of 33%, 35% and 39.6%. The plan would also cap the tax rate on interest, capital gains and dividends at 20%. Today, interest is taxed as ordinary income and in certain cases, so are gains and dividends, so rates on those can go as high as 39.6%. Businesses: Cut the top rate from 35% to 20% and let businesses fully expense new investments right away. Bush's plan would eliminate the requirement to U.S. taxes on foreign-earned income, and repeal most business tax breaks. Jack up the standard deduction for individuals by $5,000 to $11,300; and by $10,000 for joint filing married couples to $22,600. By doing so, Bush's plan could reduce the number of people who itemize their taxes by 88%, the Tax Policy Center estimates. Normally you only itemize when the value of your tax breaks exceeds your standard deduction. Eliminate the state and local income tax deduction, the state and local sales tax deduction and the property tax deduction. Cap the value of itemized deductions at 2% of adjusted gross income. Excuse older workers from having to pay the payroll tax. Anyone who is still working after reaching full retirement age -- 66 or 67 depending on when you were born -- would not have to pay the employee portion of Social Security and Medicare payroll taxes. Combined, that amounts to 7.65% of their income up to roughly $118,500 this year. Repeal both the Alternative Minimum Tax and the current estate and gift tax. Some people who inherit assets may be required to pay a bigger capital gains tax bill than they might under today's code. Currently, if you inherit an asset, you don't have to pay tax on any of the capital gains accrued during the life of the person who died. Under Bush's plan, an estate could still protect heirs from having to pay that tax on previous gains but only on $5.43 million of assets. Above that amount, they would have to pony up. But the new rule would exempt anyone who inherits assets from a spouse. The richest tax filers. The average tax cut for everyone amounts to 3.9% of income, or $2,800. But for those in the top 0.1%, the average tax cut would be 12%, or $800,000. Bush's plan could boost incentives to work, save and invest, assuming interest rates don't change much, the Tax Policy Center said. But that's a big assumption since the plan drastically cuts revenue. That would force the government to borrow more than planned, which could push up interest rates and tamp down positive economic effects. 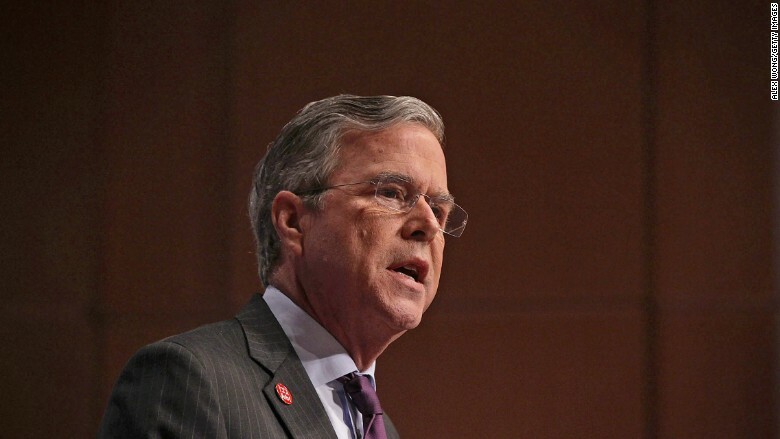 The Bush campaign said it plans to pay for the revenue loss through spending cuts. But cutting $6.8 trillion is very hard. Len Burman, who runs the Tax Policy Center, noted that by 2026 an estimated $715 billion would have to be slashed. That's roughly the same amount projected to be spent on all of defense that year or on all of nondefense federal programs other than entitlements. "Offsetting a deficit this large would require very large cuts in entitlement and discretionary spending," the analysis noted. And that could prove very difficult politically.